Long-lived Legionella in VA water system: Current outbreak very similar to 1982 strain – microBEnet: the microbiology of the Built Environment network. Seems like Legionella has been in the news a lot recently, with more and more outbreaks occurring (see recent posts here, here, here, and here). One of the largest outbreaks was in the VA hospital in Pittsburgh which got a lot of press because it occurred over a entire year and there have been numerous accusations of a cover-up. 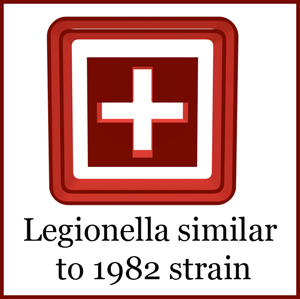 All that aside, the recent revelation that the strain responsible for this outbreak is extremely similar to one from the same hospital in 1982 is pretty interesting. Legionella is known to persist for long periods in buildings, but if it can truly hang around for decades, reappearing to cause infection from time to time, that’s pretty worrisome from a public health perspective. I hope this isn’t just another dumb architect’s (that’s me) question: Just because it is the same strain, does that mean it went quiescent or into the “stationary phase” (Kolter et al 1993. “Stationary Phase of Bacterial Life cycle” Annual Rev. Microbiol. 1993.47:855-74.) in the VA hospital and has just re-emerged into an active or mobile phase? Or is it possible this strain has been around the area surrounding the hospital or in the water supply in the area all this time and that the usual controls on sources in the hospital (water heaters, air-conditioner cooling towers, spas, etc.) were simply insufficient at a time when temperature conditions in the hospital water supply and/or system were within the usually Legionella-friendly range of 35 to 39 C.? Hal, The hypothesis is the second of the two things you mentioned… that the bacteria has just been living in the water system within the hospital for decades, at a very low level and occasionally conditions have changed such that there is an outbreak.